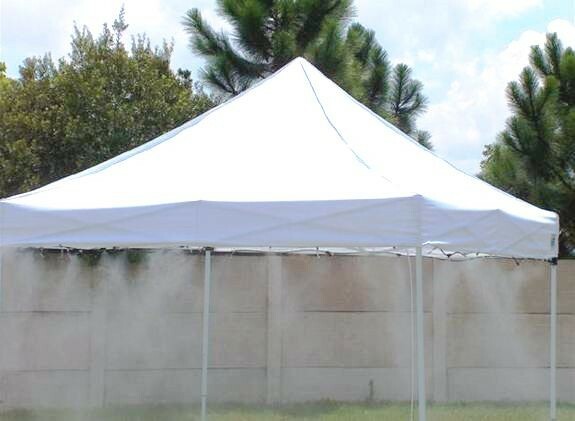 These medium-pressure misting tents include everything you need to set up a 10' by 10' canopy with a fully functional misting system wherever you need cool, shady comfort. This incredible misting tent system includes twenty mid-pressure misting nozzles, a 160 pounds per square inch (psi) booster pump, and a 10' by 10' canopy available in your choice of red, white, yellow, or blue canopy colors. 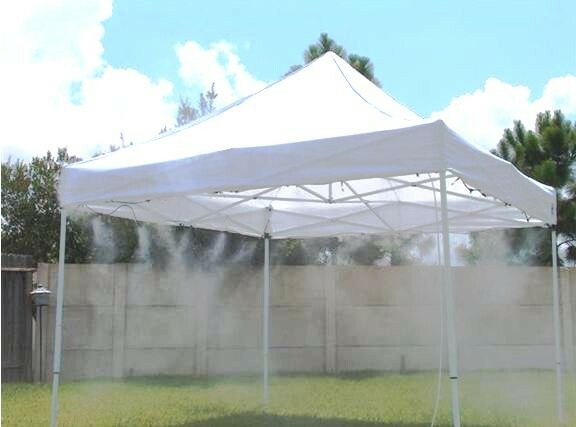 This misting tent package makes a great deal for first-time canopy buyers and for anyone looking to invest in a misting/canopy combination. And if you're looking to upgrade your existing 10' x 10' canopy by adding a misting system, we also offer stand-alone kits in low-pressure, medium-pressure, and high-pressure varieties. This is like a gift from heaven! We get so hot in the summer. Can you please tell me if this tent with 40 pound weights on each leg would not bend or buckle or flee in 30 mph gusts? Is it constructed to not pool rain water? What is the warranty on this tent? There is a 2-year manufacturing warranty. This tent does not have a wind rating so you will need to use your own judgement when set up in windy conditions and you will need to knock off any water from the top to avoid pooling of water.